According to Hun Sen’s official Facebook page, the US$600 million aid will run for three years, from 2019 to 2021. He also mentioned that Chinese President Xi Jinping has pledged to import 400,000 tonnes of rice from Cambodia this year and wants to increase bilateral trade between the two countries to US$10 billion by 2023. There were also closed-door talks where the two leaders reportedly witnessed the signing of six agreements, including for increased cooperation on China’s ambitious Belt and Road Initiative (BRI). Cambodia is slated to play a major role in China’s plans for the region. The country is hoping that the BRI will improve its economy as well as improve connectivity within its borders. Among the projects being developed by China is the Cambodia Sihanoukville Special Economic Zone which will create more jobs and bring in investment for Cambodia. For Cambodia, Chinese investments will play a major role in developing the nation. Despite being regarded as one of the region’s fastest growing economies, growing at a rate of about seven percent, the population is still largely poor. In the Gross National Income (GNI) per capita at purchasing power parity (PPP) index, Cambodia is the lowest ranked country in the region at 147th. Infrastructure developments by China are also crucial for Cambodia. For example, the Cambodia Sihanoukville Special Economic Zone which aims to become the “Shenzhen” of Cambodia, will reportedly create about 100,000 jobs. On top of that, Cambodia remains a largely agricultural country with many of its exports heading to China. To increase its output and exports, Cambodia would need an upgrade in infrastructure. Furthermore, Cambodia needs Chinese aid more than ever before as the European Union (EU) has announced that it plans to impose trade sanctions on Cambodia for alleged human-rights violations. Cambodia is part of the EU’s Everything But Arms (EBA) initiative which aims to help poor countries by giving them special access to EU markets. International media have reported that the European Commission in Brussels has asked EU national governments to give their approval by 29 January to suspend Cambodia’s quota and tariff free exports to the EU. These investments are not without issues though. In Sihanoukville the sudden flux of Chinese investments and Chinese companies has completely transformed the city from a sleepy beach town to a buzzing centre of activity with many Chinese-run businesses. Locals have complained that the presence of Chinese money has created a “closed loop” with few meaningful opportunities for local players to make a profit. There is also the question of China legitimising Hun Sen, a leader with a very questionable human rights record. In July, Hun Sen managed to secure his victory in the country’s general elections amid a political crackdown which saw the dissolution of the Cambodian National Rescue Party (CNRP), the arrest and prolonged detention of the CNRP’s leader, Kem Sokha, and the banning from political activity for five years of 118 senior CNRP members. Some experts have said that providing Cambodia the aid it requires will only consolidate Hun Sen’s grip on the country. However, studies have shown that this may not be an effective tool to bring change as it often ends up hurting the citizens more than its leaders which does more harm than good. 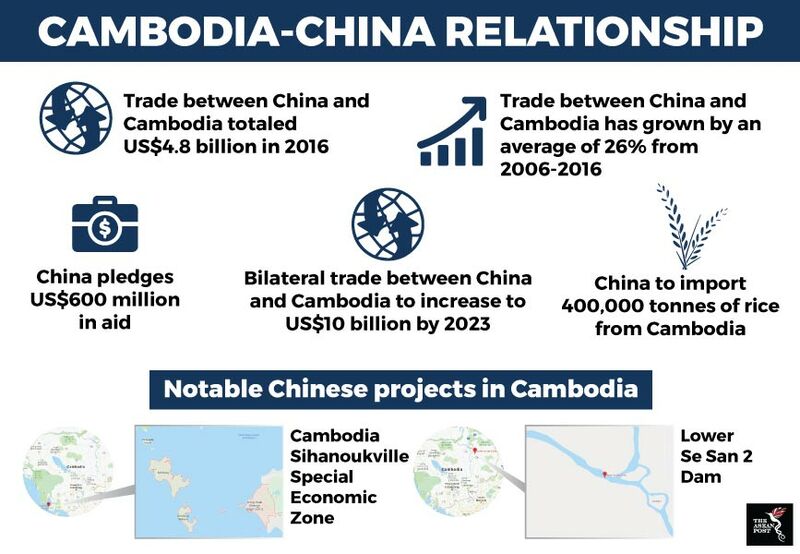 While Cambodia reaps the benefits of Chinese aid, China will also stand to gain from Cambodia being on its growing list of allies in the region as it seeks to exert its influence here. There is also speculation that China is looking to build a naval base off the Cambodian coast. Earlier this year, three Chinese warships arrived in Sihanoukville. According to a statement from the government there, the visit by the warships was to strengthen bilateral ties between the two countries. Hun Sen has repeatedly denied reports that a Chinese naval base will be established there. The aid to Cambodia could prove integral to developing the country and improving the lives of its people. However, as the relationship between the two countries reaches new heights, the future of Cambodia’s democracy and sovereignty continues to hang in the balance.